In the year or so I have spent reviewing cars at Ars, in addition to my usual managing editor duties, I’ve generally stuck to SUVs, crossovers, and minivans. Some of them can go very fast—the Alfa Romeo Stelvio Quadrifoglio, BMW 640i GT, and the Maserati Levante come to mind—but the McLaren 570S Spider is quite a different beast. After a quick chat with Automotive Editor Jonathan Gitlin, I replied with a “yes, please.” A week later, I found myself pulling out of the garage at the McLaren dealership in downtown Chicago behind the wheel of a $235,340 supercar. 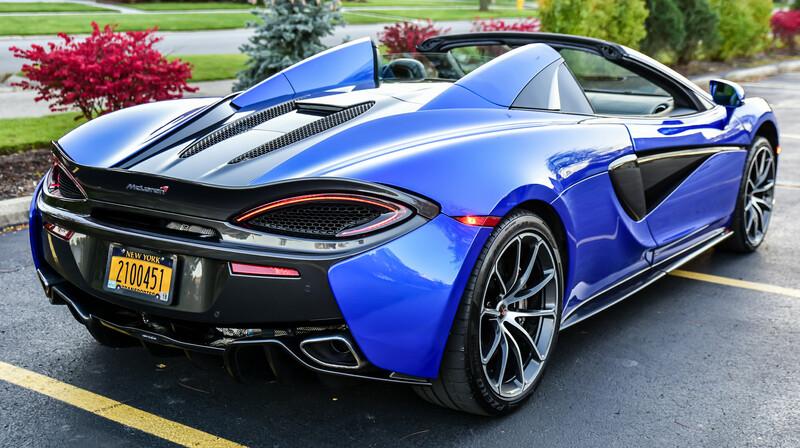 When it comes to McLarens, the 570S Spider is toward the low-end of the price spectrum. New for the 2018 model year, the Spider is a convertible version of the 570S, a model that itself hit the market in 2015. Capable of a top speed of 196mph with the 101lb (46kg) roof down, the 570S Spider can hit 204mph with the hardtop in place. Speeds like that come naturally to a car that has a 3.8-liter V8 twin-turbo engine and weighs just a hair over 3,300lb. The 562hp (419kW) engine offers 443lb-ft (600Nm) of torque and is paired with a seven-speed dual-clutch seamless-shift gearbox.